This is a great recipe. I am always amazed at how it turns out. 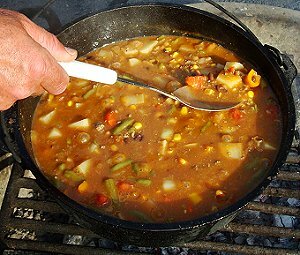 It must be some Dutch oven magic going on that transforms it into the wonder stew it becomes. Made this last weekend boy was it good, kicked it up a bit with some jalapeno's will be making it again in football season. This recipe is a definite hit. Everyone loves it! This is a great stew! I use pork sausage ipo ground beef and add some jalapenos. You said, "All recipes use a 12-inch dutch oven, unless specified." Is that a regular 12" or the deep 12"? I have both and want to make this in the deep and make the maximum quantity. @Dave - Lodge, 12-inch, 6-quart size. If you want to make some other size, you'll have to figure out the difference. In an 8- quart, you might be able to fit 133% of the amounts. I made this for the Troop leaders. It was awesome and there were no leftovers. I will make this again and at home. @Brian- Ha! I just made it last week. It's one of my wife's favorites. Great recipe! Always a winner. The leftovers taste even better. Made this tonight for supper. It was delicious. I don’t go camping so made it on my stove. Only thing I changed was added diced tomatoes with green chilies. Will have plenty to freeze and have for later. Thanks for such a good recipe.